Turtledove, Harry, and Roland Green (eds.). Alternate Generals . Baen 1998. Summary: Collection of new stories, including Janet Berliner's w88 android, Lillian Stewart Carl's "The Test of Gold", Bill Fawcett's "The Last Crusader", William R. Forstchen's "A Hard Day for Mother", Esther Friesner's "An Old Man's Summer", Brad Linaweaver's "And to the Republic for Which It Stands", R.M. Meluch's "Vati", John W. Mina's "Vive l'Amiral", Elizabeth Moon's "Tradition", Jody Lynn Nye's "Queen of the Amazons", William Sanders' "Billy Mitchell's Overt Act", S.M. Stirling's "The Charge of Lee's Brigade", Brian M. Thomsen's "Bloodstained Ground", Lois Tilton's "The Craft of War", Harry Turtledove's "The Phantom Tolbukhin", and David M. Weber's "The Captain from Kirkbean". Comments: Green does not receive cover credit as co-editor but is listed on the title page. The copyright page also lists Martin H. Greenberg as co-copyright holder, and thus possibly co-editor. Turtledove, Harry (ed.). 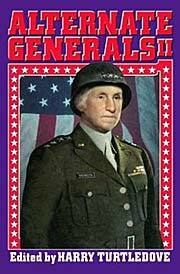 Alternate Generals II . Baen 2002. Summary: Collection of new stories, including Chris Bunch's "Tarnished Glory", Noreen Doyle's "Horizon", James Fiscus's "American Mandate", Michael F. Flynn's "Southern Strategy", Esther M. Friesner's "Labor Relations", Roland J. Green's "George Patton Slept Here", R.M. Meluch's "Twelve Legions of Angels", Joel Richards' "In the Prison of His Days", William Sanders' "Empire", Susan M. Shwartz's "And the Glory of Them", S.M. 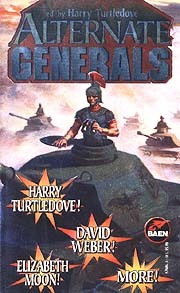 Stirling and Richard Foss's "Compadres", Judith Tarr's "Devil's Bargain" and Harry Turtledove's "Uncle Alf". Comments: The copyright page also lists Martin H. Greenberg as co-copyright holder, and thus possibly co-editor. Published: Baen 2002 (0743435281BUY), 2004 (0743471865BUY). Summary: Collection of new stories, including Lee Allred's "East of Appomattox", Chris Bunch's "Murdering Uncle Ho", Lillian Stewart Carl's "Over the Sea from Skye", A.M. Dellamonica's "The Illuminated Heretic", James Fiscus's "The Road to Endless Sleep", Esther Friesner's "First, Catch Your Elephant", Roland J. Green's "'It Isn't Every Day of the Week…'", Brad Linaweaver's "A Good Bag", John Mina's "I Shall Return", Mike Resnick's "The Burning Spear at Twilight", William Sander's "Not Fade Away", Judith Tarr's "Measureless to Man", and Harry Turtledove's "Shock and Awe". Published: Baen 2005 (0743498976BUY), 2007 (1416521143BUY).